SEOUL, April 6 (Yonhap) — A senior member of the Parliament of the European Union pledged Friday the region’s continued support for denuclearization and ultimately the reunification of the two Koreas in a meeting with a senior official here. 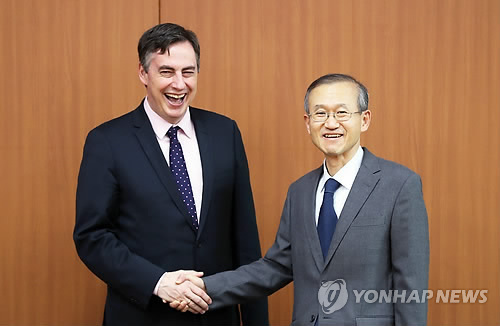 „We have shown solidarity with Korea in all those years especially in the last few very challenging years,“ David McAllister, the chair of the European Parliament Foreign Affairs Committee, said in the opening of his meeting with Vice Foreign Minister Lim Sung-nam. „We will continue to support our policy of peaceful cooperation of the two Koreas and denuclearization of the Korean Peninsula and eventually, hopefully reunification of your country,“ McAllister told Lim. The German politician and his delegation of the EU parliamentary committee on foreign affairs held the meeting in Seoul to discuss North Korean nuclear issues ahead of President Moon Jae-in’s summit with North Korean leader Kim Jong-un on April 27. Lim appealed to the EU delegation for support and cooperation, as Seoul is striving to achieve the long-sought goal of discarding North Korea’s nuclear weapons program and building a peace regime between the two Koreas in the Moon-Kim meeting, as well as in a summit planned between Kim and President Donald Trump. „We are witnessing a sea change on the Korean Peninsula,“ Lim told McAllister. „We will have very candid and open-minded conversation about where we will be going down the road and I do hope that we also learn from the various experiences Europe has gone through in the past decades,“ he said, referring to the summits. The EU has increasingly reached out to North Korea recently, with the North Korean foreign ministry’s director general for European affairs, Kim Son-gyong, reported to have met with high-rank EU officials in Brussels, Belgium, on Wednesday over the nuclear issues and other bilateral matters. A delegation of the European Parliament also said last month that it has been having „secret talks“ with Pyongyang over the last three years in a bid to persuade the regime to negotiate denuclearization. During the Friday meeting in Seoul, Lim and McAllister also discussed ways to tighten relations between the two sides and cooperation on dealing with Northeast Asian issues and fighting protectionism, according to the foreign ministry. Later in the day, South Korean Defense Minister Song Young-moo also had discussions with McAllister on North Korea and bilateral security cooperation, according to Song’s office. The minister briefed him „in detail“ on Seoul’s efforts for the denuclearization of the peninsula and peace and requested the European Parliament’s support. McAllister appreciated the government’s peace initiative and expressed hope that the upcoming inter-Korean summit will fare well, added the ministry.